Jan Estep, “Amy Cutler,” Rain Taxi, Vol.12, No. 1, March 2007, 34-35. Deutschland, bleiche Mutter (Germany, Pale Mother), presents her life as a young girl during World War II and the reconstruction afterwards. Focusing on the relationship between mother and daughter, in the middle of the film, a long scene captures the two homelessly roaming the snowy countryside while the father is away fighting. Traveling to relatives in Berlin, their long hike is paced by the mother reciting the Grimm’s fairy tale, “The Robber Bridegroom.” It is a dark tale of a murderous, cannibalizing fiancé, and as the storytelling progresses, the world around the mother and daughter reflects the grim tone. Their behavior too turns ominous. The pair robs clothing from the frozen body of a dead soldier. They pass through an abandoned factory, pausing to share a bit of bread with concentration-camp-like smokestacks towering over them. The betrayal, horror, and ultimate survival central to the fairy tale mirror the war-torn experiences of Germany, and the viewer understands the way the make-believe story frames the real-life experiences of the little girl. Throughout their trek, she silently listens as her mother narrates. Decades later, that little girl is all grown up. 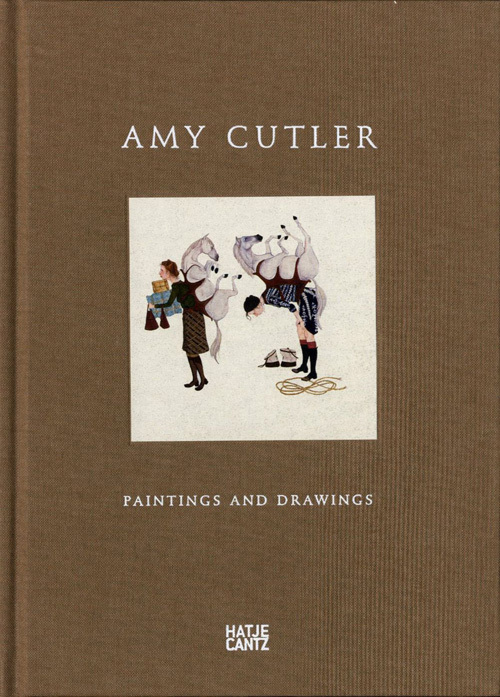 She and her companions now roam the countryside of Amy Cutler’s drawings and paintings [Lisa D. Freiman, Amy Cutler, Paintings and Drawings, Hatje Cantz, 2006]. Cutler too presents dark scenes of women and young girls wandering through fantastically wrought forests, though her ambiguously charged stories are more surreal than real. Women’s body parts turn into teapots and brooms, babies chokingly glom onto their mothers’ mouths, pigs are wrestled for domestic control, long Rapunzel braids alternatingly enable freedom or enforce captivity, and thoughts fly like birds in and out of the women’s birdhouse heads. In Rations, two women are conjoined by a Pinocchio-long nose, one with cleaver in hand, the other with a baguette, both ready to share or to attack with their barter. A third woman stands alone, nose cut off, cleaver hanging limply at her side. In Sweetie, Sweetie, two women struggle to devour each other’s heads that are transformed into double-layer chocolate cakes. Traction shows a front-guard of women using their over-long braids to drag a house along the ground; a choir of similarly long-plaited girls watches out of the windows, their hair wrapped like spools of wool in an upstairs bedroom. Despite their obvious predicaments the women themselves appear to be nonplussed. Unlike the straightforward deceit of “The Robber Bridegroom,” there is no clear sense of good and evil, right and wrong. A pervasive feeling of nonchalance dulls the moral compass, leaving it open whether or not they are happy or in need of rescue. In both Sanders-Brahms’s and Cutler’s work, older women introduce younger women to ways that are rife with violent undertones. Neither artist shows this maternal tutelage to effect noticeable trauma, yet the feeling of potential corruption underlies both. Their work raises the question whether or not children are capable of handling such information. Fearing their vulnerability over their common sense, and in building a case for his ideal Republic, Plato argues for censoring what young children are exposed to. He believes that censorship can eliminate conflict and ill behavior among citizens. As the thought experiment goes, if from the time they are born children are isolated from negative influences, and are only provided stories of goodness, then they in turn will be good. Lacking exemplars of bad behavior, they won’t know any other way to behave. For Plato a strict diet of moral fare ensures a moral community. He uses this logic to censor classical myths that portray Greek gods as licentious, adulterous, greedy, vengeful, and all manner of un-god-like behavior. We should not tell stories that show our gods to be inconsistently good and bad, for this confuses a young mind unable to discriminate. Plato attributes great power for stories to influence listeners. However, he wants to use that power to manipulate people strictly in a positive way. Though it radically underestimates a child’s ability to distinguish good and bad, this line of thinking resonates. It makes sense of the judgment that the little girl in Deutschland, bleiche Mutter should have been told to look away, shielding her eyes and ears from the horror around her. A contemporary version of this argument appears every time someone resents the presence of violence or sexual material on TV or decries the impact violent video games have on those who play them. Accordingly, when young people watch actors killing or beating each other, flaunting their sexuality, or ratcheting up the vicarious identification further by actually becoming the stalker/killer themselves in first-person video games, then these behaviors become an internalized part of their repertoire. Because fictitious stories by their very existence model acceptable choices, fictional violence and sexuality beget real violent and sexual acting out. The child is unable to discern what is appropriate because s/he lacks the rational capabilities to understand consequences and to make an ethical choice. Consequently, a clear standard of right and wrong erodes in the face of contradictory messages. So, does Lena, the mother in Sanders-Brahms’s film, teach her daughter that murder is acceptable, or does Cutler’s crew advocate attacking one’s social adversaries? Some would protest that watching or reading such material has a cathartic effect, purging individuals of their less-than-noble desires. Fiction creates a release valve for all of our pent-up, repressed negativity, allowing us to express them by proxy and thus diminish that energy. In The Uses of Enchantment (1975), child psychologist Bruno Bettelheim explores the meaning of fairy tales along similar lines. Responding to parents’ fears that the Grimm’s stories will scar their children, Bettelheim describes the therapeutic effect fairy tales have for young minds. The negative characters help children acknowledge contradictory impulses inside themselves: selfish greed, fear of being abandoned, competition for love, hatred for one’s parent, and anger at one’s powerlessness. The stories show there are others who share these feelings, showing the child she is not alone in her monstrous desires. Each fairy-tale ending also provides a possible resolution of good and bad; the goal is to confront and then master what is inside. Amy Cutler’s imagined world is closer to Bettelheim and the Brothers Grimm than to Plato. Factual causality gives over to what Bettelheim calls “the truth of our imagination,” a truth far more revealing of subconscious conflict than overt effect. As reason fails to pry open the secrets of her fantastic scenarios, viewers are forced instead to their own psychologically motivated interpretations. Caretaking run amok, subject turned into object, and group effort undermined by individual wants: what one finds there depends on what one needs to see. As Bettelheim writes, each of us is drawn differently to fairy tales; like art they do not operate universally. Often we can’t engage. But every once upon a time a story leads to deeper meaning. It takes us back along the trail till we are as comfortable in the deep, dark woods as Little Red Riding Hood, Gretel and the rest.